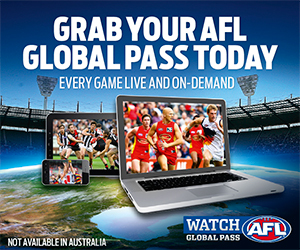 The highly anticipated South China AFL Grand Final Day showcased 7 games wrapping up the season with the whole finals series in one day. With the SCAFL Premiership Cup up for grabs every game was played with “Do or Die” outcome. Hosts Macau Lightning put on a great show at the International School sports ground with Aussie style BBQ drinks and PA commentary all day. Players travelled from all over South China, the Guangzhou Scorpions, Guangdong Seagulls, Hong Kong Dragons 3 teams Typhoons, Cobras and Lizards all in attendance. The day started with Auskick International Games organized between the representative side of the Hong Kong Junior Dragons and The Junior Macau Lightning. SCAFL Major Sponsor Port Adelaide FC was in attendance in force with 3 representatives, including 2015 player Jared Polec out with a foot injury. 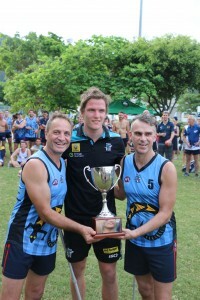 Jared (Pictured) presented the new South China AFL Premiership Cup to the winning Lantau Lizards Captain Paul Malia and playing Coach Warrick Kendall. AFL Asia’s President Darren Whitfield announced the award winers and thanked all teams, committees, and behind the scenes workers in the SCAFL for their efforts in running the competition throughout the year. Cumulative Best Player of the Year was presented to Guangzhou’s Chen Shao Ling, runner up HK Typhoons Justin Barbaro. Years best Goal Kicker was also won by the Scorpions Chen Shao Ling and followed closely by Typhoons Grant “Pav” Davis. Port Adelaide provided a signed ball and top for these players. The Day was finished off in style with a short walk across to the Sheraton Macau (Hotel and Casino), where a stunning poolside “Aussie BBQ” buffett was organized by the Macau Lightning to end the days celebrations.